Earth's surface hosts many forms of snow and ice, including sea ice, lake and river ice, snow cover, glaciers, ice caps and sheets, and frozen ground. Together, these features are known as the cryospherecryosphere: the set of all locations on or beneath Earth's surface where frozen water exists.. Snow and ice are a vital part of the global climate system because they influence air temperature, sea level, ocean currents, and storm patterns all over the world. Life on Earth depends on the cryosphere for many different things. In Arctic regions, sea ice provides a home for animals like seals and polar bears, feeding and breeding areas for a variety of migrating species, and hunting grounds for local communities. Much of the world depends on the cryosphere for fresh drinking water, while others use it for recreationwithout the cryosphere, there would be no skiing, sledding, or snowball fights! Although concentrated in the polar regions, parts of the cryosphere can be found at nearly all latitudes, which make them useful indicators of global climate and climate change. Different parts of the cryosphere change on different timescales ranging from less than a day to more than a millennium, as shown in the figure below. Scientists keep a close watch on the cryosphere and patterns in how the cryosphere changes over time to find important clues about the health of our planet. In Part A of this Lab, you will learn about the different components that make up the cryosphere and where they can be found on Earth. In Part B, you will be introduced to some of the ways climate and the cryosphere influence one another, as well as how and why scientists study changes in our planet's snow and ice. In Part C, you will learn about some of the ways that humans, plants, and animals are connected to and affected by the cryosphere. 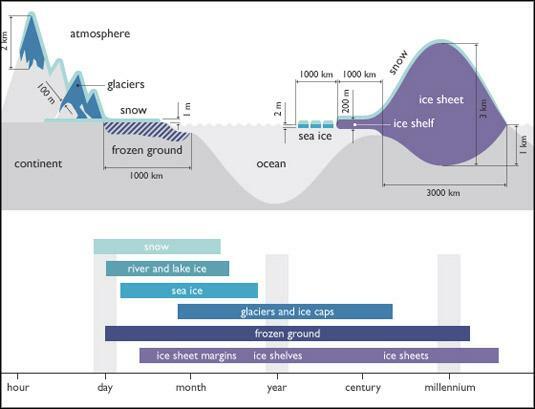 explain why scientists use the cryosphere to study climate. Throughout these labs, you will find three kinds of questions. Checking In questions are intended to keep you engaged and focused on key concepts and to allow you to periodically check if the material is making sense. These questions are often accompanied by hints or answers to let you know if you are on the right track. Stop and Think questions are intended to help your teacher assess your understanding of the key concepts and skills you should be learning from the lab activities and readings. Discuss questions are intended to get you talking with your neighbor. These questions require you to pull some concepts together or apply your knowledge in a new situation. Your teacher will let you know which answers you should record and turn in.